I want to start sharing more about Myanmar culture on here. It’s so different, in both good and “are you kidding me?” ways and I thought it would be fun to share some of these things with you all. I’m no pro because, really, I’ve only been here 6 months, but we will pretend like I am one, ok? So let’s get started shall we? Today we are talking about money! For starters, let me tell you that Myanmar is a cash only society. Literally! If you go into the grocery store and hand them a Visa credit card you will walk out with no groceries. Everything is paid for in cash! Even our apartment was paid in cash and rent is paid for the entire year, upfront. One year’s worth of rent up front! Here is our ‘rent money’. It was kind of crazy, funny and a (hopefully) once in a lifetime experience. Although it is a cash society they do have ATM’s…sort of. ATM’s as the rest of the world knows them and Myanmar ATM’s. Here is how they work – I can not go to an ATM and put my American card in. They don’t work like that. See, if I want to use an ‘ATM’ I have to go get a Myanmar bank account and then get a pre-paid ATM card where I can withdraw cash. Like a pre-paid Visa card you get for your birthday. They do have a few ATM’s here that you can use for a debit card but I haven’t used my card in so long that I forgot my pin number (which I realize that could be a real problem at some point) and I don’t know that I trust the ATM’s here. So Dave and I do everything in cash! Which means we brought in a big chunk of change and when people come and visit they are our ‘bank’. 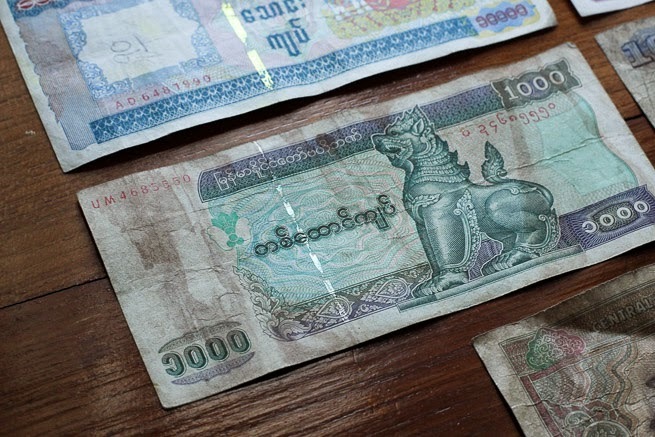 Now here is another Myanmar thing – they only accept perfect, brand new, rarely used, must have no marks, straight from the US Mint dollar bills. It might not sound like a big deal but let me tell you, I have had to haggle and get down right mean to get them to take my beautiful and crisp American dollars. Do you see the bend in the bill? GASP! Now, the attendant meticulously studied, analyzed and looked at those bills. Almost like the world’s best scientific discovery was about to happen … then she looked at me and said she wouldn’t take any of my money because one bill had been folded, one had a red stamp on it and one had a small smudge of black ink on it. I, in a very stern way, informed her that this was very good American money and that there was nothing wrong with it. I told her I drove super far to come here and that I HAD TO BUY GROCERIES! I felt like the world’s meanest missionary but I also knew I wasn’t driving another hour to bring her more USD. So after a heated discussion, mostly on my end explaining to her that the bills were good, I told her she was absolutely going to switch over at least one of those bills, which she reluctantly did and I bought my groceries, and still felt like a mean and horrible Christian person…. Sometimes people in stores try to give me torn money because I’m an ignorant Westerner, and for a good long while I was, but now? If it is super crumpled and disgusting I give it right back, smile and tell them I need a different one. I will say that although this all sounds crazy it eventually all works out just fine. There is a nice man downstairs who will take just about any kind of money and I am so thankful for that man! It also is teaching me to appreciate how financing works in America. We really do take that for granted. Do you prefer to use cash or a card? Does anyone know of other places in the world that operate like this?things! This was such an interesting post...I was getting frustrated for you when talking about exchanging the bills! So, question: if they give you torn money in return, can you not use that? 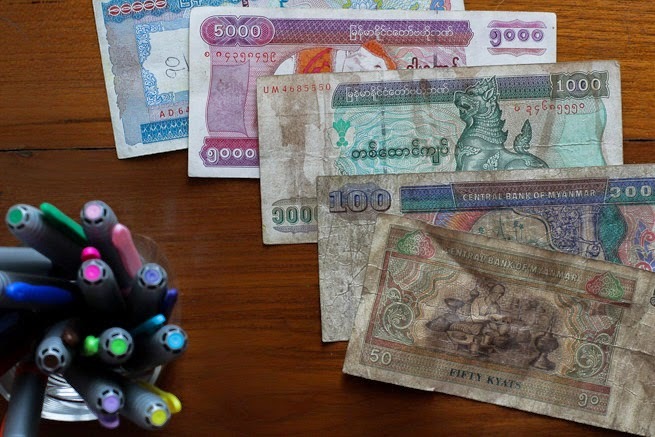 Are they as picky about taking Myanmar money as they are about American money? Also, why do they only accept crisp, clean US dollars? Are they afraid it's counterfeit? What do THEY do with the US money? Do they exchange it at a bank or something? This is so bizarre and interesting! I have to give you tons of credit - I never would have dreamed that living in another country would take so much adjustment on so many levels. But like you said, it all works out in the end. Thankfully! wow that is super crazy/interesting!! i am curious if they take the crumpled up Myanmar money? is it just the US money that has to be perfect? i wonder what they are doing with it!! Yes it is duper frustrating some days but we manage ok. If they give me torn money in return I pretty much can't use it. I learned this the hard way. So now if they give me torn bills I hand it right back and they give me a new one. 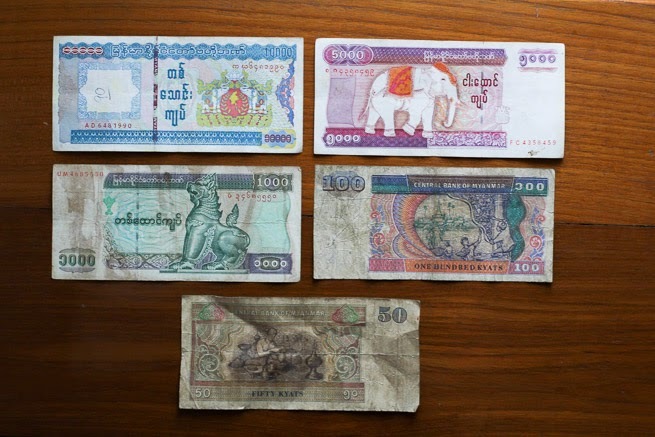 Also, the money exchange people I now go through all the Myanmar bills they give me and swap out ones that aren't in pristine condition. 1. They think that serial numbers with CB on it stands for counterfeit bill. I'm not making that up either! 2. They view cash like we view gold because they don't know better yet. So if you were going to buy a gold brick if it was scratched and majorly tarnished you wouldn't take it. They don't know that the dollar bill doesn't work that way. They think if it is pretty and perfect it will be worth more. I have no idea what they do with the USD. I'm guessing they wait until the exchange rate is really good and then trade them in. I should research that too. I never dreamt of living here either but here I am! There are really wonderful people here though they just are so behind with everything but that also isn't their fault. They do not take the crumples up Myanamr money. I learned this the hard way. So now if they give me change or if I am exchanging money, if it isn't in good condition I hand it back and ask for a better one. I don't know what they do with the money but my guess is they wait until the dollar is really strong and then exchange it for Myanamr money. I can't believe how picky they are with US dollars!! I wonder if they believe that it's not worth the same if it's not in pristine condition? That's the only logical explanation I can think of! And then of course their money is thrashed- I'm so glad you've been able to stick up for yourself as a westerner and ask for different bills! Guatemala was definitely a cash only society (I didn't use my debit card once), but I never had any problems with condition of money I was exchanging or otherwise. I definitely prefer card- I get nervous with cash on me! Oh gosh, Peru is the same way with US bills!!!! Well, in the majority of exchange houses ;) we know some places to go (like downtown) where they take bills that are bent or torn. 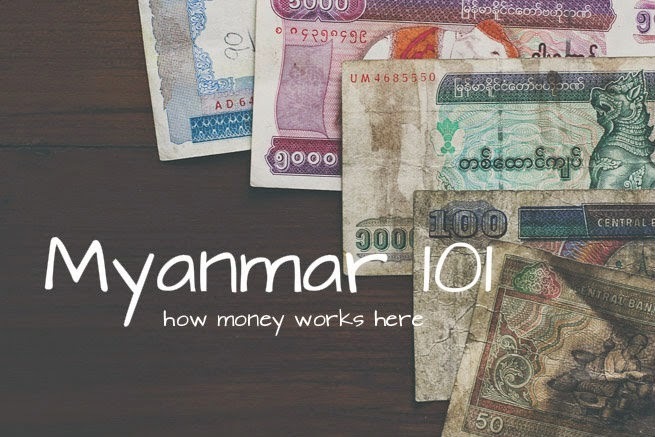 One time we were super desperate to exchange money to pay rent (it's monthly here, not a year up front.. that's crazy, Myanmar!) and I told the man to just take a few soles (the currency) off since the bills were torn, and he was like, "no, está bien." And I was so thankful! :) And also, yes, they give me crappy, bent, filthy bills back!!! lol. And a few times I've been cheated because I didn't know how to check if it was fake or not. Now I act like I know what I'm doing, and they give me nicer, real bills. They take cards here in most stores, but we don't use them... we always try to have cash on us! 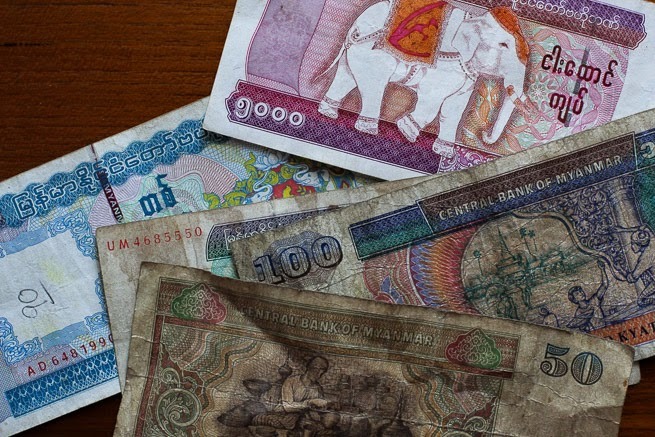 Myanmar money is so pretty! What's the exchange rate? I'm glad Guatemala wasn't crazy! In my comment to Amanda (just a scroll down the page) =) I wrote the why as to why they don't take perfect dollar bills. They are crazy!!! I figured I would research it because several of you asked. Even today I argued with someone else and I finally said "IM NEVER DOING BUSINESS WITH YOU AGAIN!" I took my money and went somewhere else and they gave me a higher rate and took my money. It's so annoying sometimes. I can see being nervous with cash on you! Thankfully theft isn't a huge issue here. 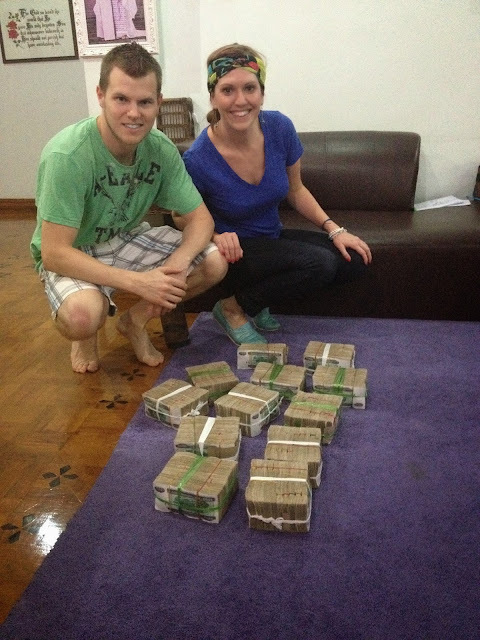 Virtual hug and high from Myanmar to Peru for us expats enduring the battle of the money! 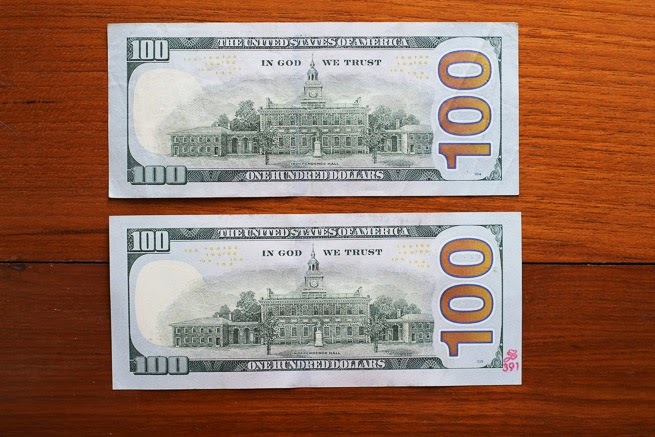 I can't believe they give you FAKE bills! That is terrible. I have torn and crappy ones but never fake. Even tonight I went to get money changed and they said it was a lower rate because my perfect $100 bills had a red stamp on it. UM! NO! I told them they were going to give me the proper rate and they said no. SO, I took my money back and said I would never do business with them again. I went to another money changer and he gave me a higher rate and took my money. It's just so odd. I still feel like a jerk arguing with them but that is just how it is. What is the exchange rate in Peru? Does it fluctuate a lot?